[PDF] The 25 Most Common Sales Mistakes: And How to Avoid Them (Audiobook) | Free eBooks Download - EBOOKEE! 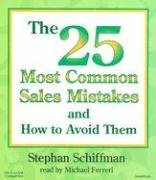 Description: Noted sales trainer, Stephan Schiffman, the famous master of cold calls and sales techniques, provides bite-sized tips on correcting common sales problems, using the same nuggets-of-advice format as in many of his other books! No comments for "[PDF] The 25 Most Common Sales Mistakes: And How to Avoid Them (Audiobook)".